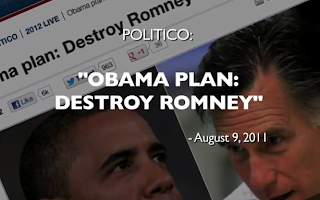 So Obama’s former staffer Bill Burton’s Super PAC Priorities USA has a disgusting attack ad out today that pretty much accuses Mitt Romney of killing a woman. They imply that after a man loses his job, he lost his health insurance, and shortly after his wife got sick and died. Alas, the timeline doesn’t add up: Romney left Bain in 1999, the man lost his job in 2001, and his wife died in 2006. This is a shameful, despicable smear ad that makes me sick to my stomach. Between Dirty Harry Reid smearing Romney with lies saying he didn't pay taxes for 10 years and that his dead father should be ashamed of him, as well as attacks on Ann Romney, the Obama campaign's scorched earth politics of personal destruction has begun. We are only at the beginning of August, is there nothing Obama and his allies won't do? Any despicable attack or vicious lie they won't spread? How much longer can we bare to live in Obama's sick, twisted, disgusting, unconscionable, heinous, political world? November can't come soon enough! P.S. Don’t forget - Romney has literally saved lives. Mitt Romney and Bain Capital bought GST Steel at some point. Romney left day to day operations of Bain in 1999. Thereafter, Bain offered Joe Soptic a buy out and he refused. Eventually the steel plant went out of business and Joe went on the unemployment line. That happened in 2001. In 2002 or 2003, Mrs. Soptic injured her rotator cuff and left her job. She lost her insurance. In 2006, she was diagnosed with cancer and died a few days later. It is a terrible tragedy that Mitt Romney had nothing to do with. It seems Mr. Soptic chose poorly on the buy out offer, lost his job, and would prefer to blame Mitt Romney than anyone else. Priorities USA has set a new standard — Mitt Romney killed a woman, despite being removed from both time of death and decision making. And Jen Psaki told reporters on Air Force One that “we don't' have any knowledge of the story of the family,” according to Yahoo! News. So, is this a new new low? Obama campaign spokeswoman Jen Psaki acknowledged Thursday that the campaign was no longer pleading ignorance about the story of a man who has appeared in both a super PAC ad and a campaign ad. "No one is denying he was in one of our campaign ads. He was on a conference call telling his story," Psaki told reporters on Air Force One. ...yesterday on Air Force One, Psaki said, "we don’t have any knowledge of the story of the family." "“We’re illustrating how long it took for communities and individuals to recover from the closing of these businesses." Not nearly as l.o.n.g. as it's going to take the country to recover from the Obama Administration! I really don't believe we have seen the depths as yet that they will go. If it was not so disgusting it might be entertaining. These people are truly uncivilized and are a textbook example of the first definition of a democrat - one who panders to the masses. Considering the context out of which Ozymandias-on-the-Potomac's campaign operates, it's not at all surprising that it has devolved not only to a Soptic, but also a SEPTIC level of sleeze. Perfect extension-to-conclusion of the (il)logical, (il)liberal worldview.